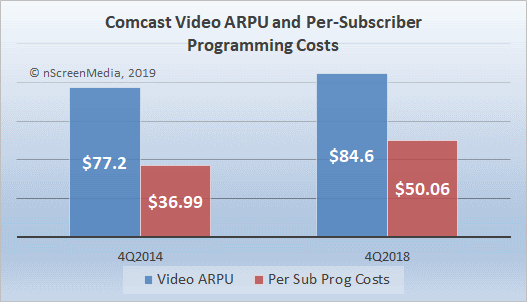 While 2018 saw a continued decline to Comcast’s pay TV cable business, it has begun to evolve its video strategy outside of the traditional bundle. Direct-to-consumer services and SVOD aggregation are key. Comcast made a spectacular recovery from years of video decline in 2016, spurred on by the success of its X1 pay TV service. 2018 shows the recovery was a temporary blip. The company lost subscribers in every quarter of last year, the first time this happened since 2012. In total, the video customers declined 371,000, or 1.7%. Meanwhile, broadband continues to grow sharply. The service gained 5.2%, to reach 27.2 million subscribers. The poor performance of the video business has a diminishing impact on the overall performance of Comcast. 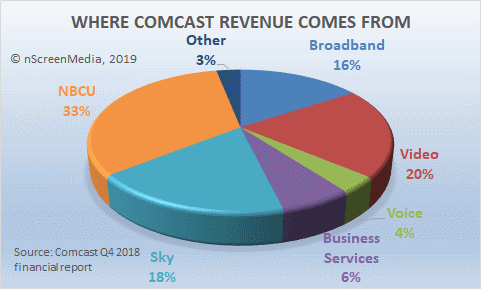 With the acquisition of Sky, Comcast’s cable video business contributed just 20% of the company’s revenue in 2018. As far as Comcast’s video business is concerned, the company seems to have accepted the inevitable, that the business is in long-term decline. David Watson, head of Comcast Cable, says the company is focusing on its most profitable customers, apparently content to let those paying less leave if they like. It’s not clear this strategy is working. Video ARPU, which measures the average revenue paid by video subscribers, is falling. It peaked in Q3 2017 at $85.8 per month and had fallen to $84.6 in Q4 2018. Were Mr. Watson succeeding in retaining the most profitable video customers, ARPU would increase as less profitable ones leave. The other strategy Comcast is employing is to aggregate SVOD providers into the X1 service. The company launched Amazon Prime Video at the end of 2018, the first pay TV operator to do so. The service joins Netflix, CuriosityStream, YouTube, and others. The aggregation strategy makes accessing and managing SVOD subscriptions easier for X1 customers. The hope is that providing a single access point for all services will be enough to keep X1 customers loyal to the service. NBCU announced it would launch a direct-to-consumer (DTC) service in 2020. The as-yet-unnamed service will draw heavily on NBCU assets and be available free to pay TV customers. In the earnings call, Steve Burke, Head of NBCU, said the service would also be available for free to Sky video customers. Non-pay TV customers will be able to subscribe for a fee, which Mr. Burke says will be competitive with other SVOD. The service will be launched using technology developed by Sky for the company’s Now TV DTC service. The other benefit to NBCU is that the service helps anchor people to their pay TV subscription. In other words, it helps protect the $23 billion in annual revenue earned by the company’s cable and broadcast businesses. Perhaps the clearest sign that Comcast has switched internal priorities away from video came in a seemingly trivial change. Each quarter, the company reports on the performance of each of its businesses. Video business performance has always been the first row in results tables and spreadsheets for the cable business. For Q4 2018, for the first time, Internet business performance is listed first, above video. Rather than fight for every video subscriber, Comcast has decided to let the least profitable customers leave. To retain the rest, it is aggregating SVOD services they might like. Comcast is also increasing the benefits of being a pay TV customer by launching a direct-to-consumer video service in 2020 that is free to them. Maybe I am missing something, but why would Netflix stand for Verizon, Tmobile, Comcast zero rating video over wireless? Isn’t this an infraction of net neutrality? I certainly agree with you, Jay. Unfortunately, the FCC doesn’t. Under new Chairman Pai, they are withdrawing net neutrality rules. So, that means net neutrality is concept, not a legal fact.